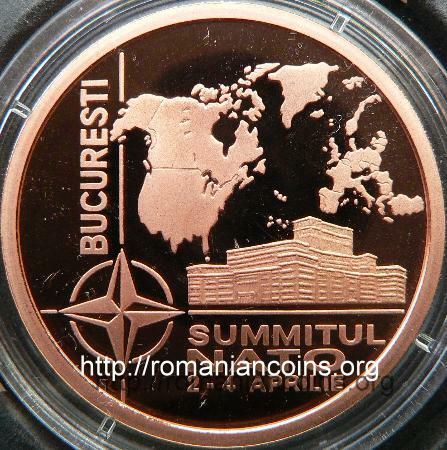 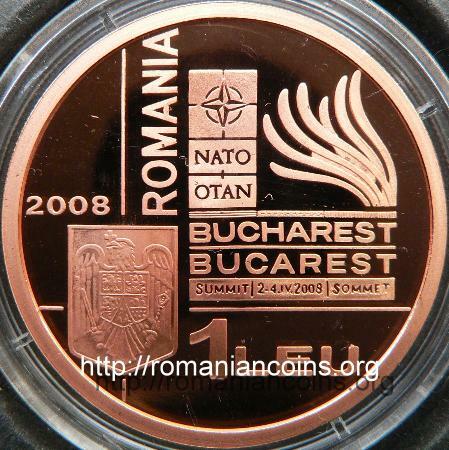 Obverse: face value "1 LEU", Romanian coat of arms, year 2008, ROMANIA, logo of the NATO Summit in Bucharest, composed from the NATO logo, bilingual inscription (in English and French) NATO OTAN BUCHAREST BUCAREST SUMMIT | 2-4.IV.2008 | SOMMET, and seven signs resembling tentacles Reverse: map of the NATO countries, the Palace of the Parliament (People's House), NATO logo, inscription "SUMMITUL NATO 2 - 4 APRILIE BUCURESTI" meaning "NATO SUMMIT 2-4 APRIL BUCHAREST"
Obverse: face value "100 LEI", Romanian coat of arms, year 2008, ROMANIA, logo of the NATO Summit in Bucharest, composed from the NATO logo, bilingual inscription (in English and French) NATO OTAN BUCHAREST BUCAREST SUMMIT | 2-4.IV.2008 | SOMMET, and seven signs resembling tentacles Reverse: map of the NATO countries, the Palace of the Parliament (People's House), NATO logo, inscription "SUMMITUL NATO 2 - 4 APRILIE BUCURESTI" meaning "NATO SUMMIT 2-4 APRIL BUCHAREST"
This set was dedicated to the NATO summit that took place at Bucharest in April 2008. 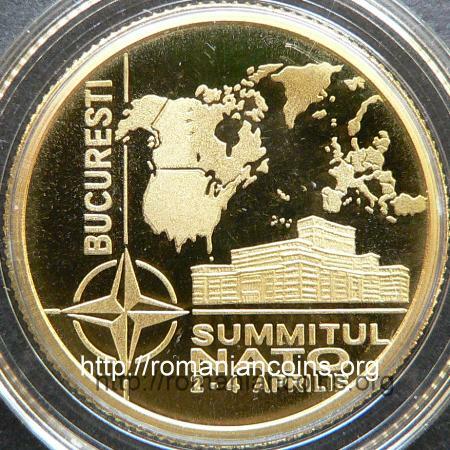 Romania became member of the North Atlantic Treaty Organisation - NATO - in 2004. 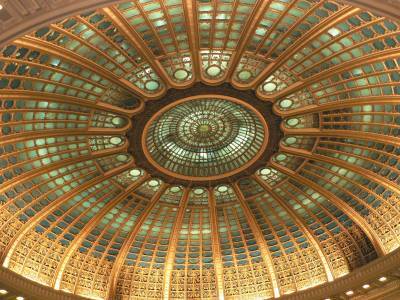 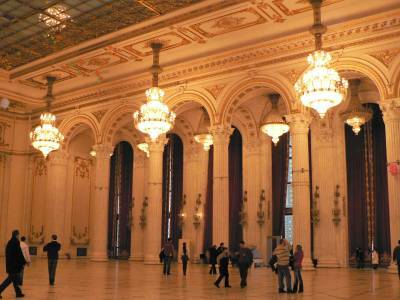 The Palace of the Parliament, known as Casa Poporului (meaning People's House), is one of the largest administrative buildings in the world. 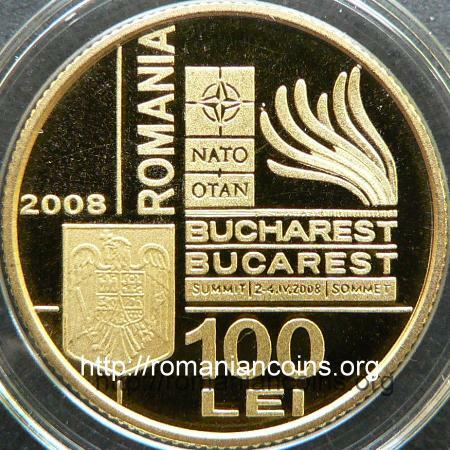 The 1 leu and 100 lei 2008 pictures above are present on the site through the permission of an anonymous donor.